When the engine was being moved about a pipe from the fuel tank to the lift pump was bent and replaced. Problem was that it was a push fit and had vibrated loose. Cancel the departure till I had managed to fix it. Took the item off the engine and cleaned with degreaser. To attempt a fix the only thing I had was some Liquid Metal glue which I wiped around the pipe and replaced into the hole. Gave it half an hour to cure and ran up the engine. No leak. Hoo-bloody-ray. Just call me Jonah. Look out Trent here I come. The weather got progressively worse as the trip went on. As time went by there were various alterations in the engine tone from the waves that built up and changed the depth of water on the prop. Even though I was fairly sure that this was what was happening it was heart stopping with the Trent to contend with. After three and half hours (I didn’t rush) reached Cromwell lock and went happily in and out and on to Newark. 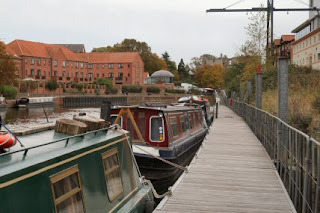 Soon reached Newark Nether Lock and moored. It is a short walk to the controls and set the paddles to empty. As I turned around the water was gushing in at the other end. Some moron hadn’t bothered to close the single paddle that was working up –stream. 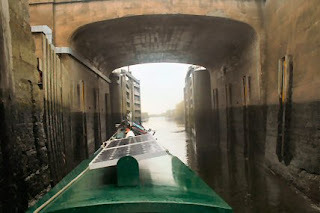 A very tight turn from the lock to the canal but was soon on my way after a longer than usual locking up. It is slow work as a singleton. Just one mooring left on the BW side of the canal which I nabbed. This will do while I have a wander about Newark and maybe do some visiting. Haven't checked my repair yet. Bob is on the look out for a replacement for me.